I don't know about you, but I buy things based on how they look as well as what they do. I was once told that you don't buy a power drill because it looks cool, you buy it because you need holes. Well, yes and no. As a designer and creative, the aesthetic also plays an important role. But what attracts you to objects also attracts thieves. And so, has the time come to "uglify your stuff?" I first read about this last year, when I saw that a number of people who owned very expensive bikes were doing their level best to make them look like $20 Craigslist rejects. It's a simple enough idea. You take your wonderful $1000 bike, and proceed to repaint it, badly, apply stickers and scratches and scuff marks, bits of old tape, dirt, grime, in fact anything you can think of, and hey presto - one expensive bike that performs like a dream but looks like a nightmare. Your average thief wouldn't look twice at this "old" thing, even though it's probably the most expensive bike in the rack. Of course, you have the downside of riding a bike that looks less than cool, but if you're a real biking fanatic that won't bother you. Just like the drill is a means to an end, so is a great bike. It seems as though this has spread to all sorts of other personal possessions now, and it runs the gamut. In May this year, blogger Jimmie Rodgers wrote about his ugly camera, and described the lengths he had gone to to make this expensive digital camera look like a cruddy old film camera. "I was able to take over 5,000 pictures with it in Brazil. I was able to follow around a number of well known graffiti artists, and you can check out some of the pics here. I was also able to go into some fairly dangerous areas, and walk out with my camera. I was even mugged a second time, and they left my camera alone, and took my $20 cell phone instead." It's a trend that's picking up steam. You can buy faceplates for expensive car CD players that turn them into old cassette players. Who'd want to steal that? And it can even go as far as uglifying your sandwich! 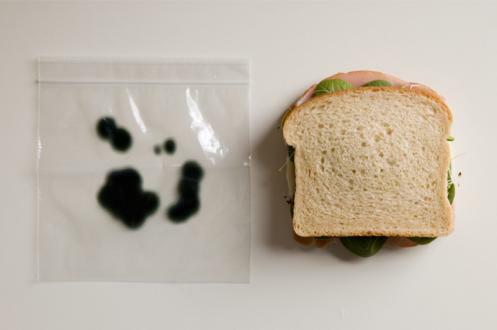 Yes, people in offices everywhere who are tired of seeing their lunch go walkies are buying zip-loc bags that have mold stains inside the plastic, making a fresh snack look like a breeding ground for bacteria. Nick Cannon has a list of 16 anti-theft ideas that puts the green sandwich bags on top of the pile. And by the way, those things are real. You can buy them at Perpetual Kid in packs of 25 for $9.99. Yes, they're more pricey than your average zip-loc baggie, but how much does it cost to replace your lunch? So, would you uglify your stuff to make it more theft-proof? Is it worth it? Aside from affecting the resale value of some things, do you value the aesthetic quality as much as the functional aspect? I, for one, wouldn't make my iPod video look like crap. And as for my MacBook Pro...stay away from that or suffer a fate worse than death! But if that doesn't bother you, then what would you uglify, and why? Over to you. ...but is an old 13-year old Camry. Has dents and dings and peeling paint. My friends think I am mad for liking my car (it runs great & I get 35-39 mph due to hypermiling) the way it is. I keep the engine and such in good shape. Had it parked in a row of nice modern cars at a theater and all 8 of those cars were broken into and stuff taken. Mine (in the middle) was ignored. I also point out to my friends that mine is less likely to be stolen for joy rides (parts are another matter) than their pretty ones. They do agree but find think it is such a deprivation for me to drive such a car. Of course people (IMO) are too attached to their cars in the first place but hey that is just me. Uglify your cash, see if I'll take it from you. Why would anyone spend the amount it would take to buy a decently running car on a bike and then destroy it? The truly frugal know how to get good things for cheap. I bought a very nice used Schwinn for $50. It took a lot of haggling but it was worth it. No sense paying the price of a car for something that you have to pedal. There are things called bike locks (the heavy chained ones with a big lock, not the plastic ones) and garages. And if you're concerned about thievery, why not simply purchase a safe or safety deposit box? Lock your doors or employ the use of a security system? There are so many less expensive, less ugly ways to deal with thieves. Really, I just don't see a purpose in ruining all of my nice things. I work hard to have nice things and I shop around so I get very good deals on what I buy. If it's not on sale, I don't buy it. @Debora I'm sorry but you cannot compare a $50 Schwinn with a Trek, or Santa Cruz, or Specialized, or Scott or a Cannondale, etc. not only that, but I'm pretty sure the parts on a $2,000 bike are much much better than that of a $50 Schwinn, whether it is on a road bike or a mountain bike. And yes you can get those $100 bike locks but thieves can be really tricky and smart, I've had friends gotten their bike stolen with those locks. I've done this for years with my homes. The last one I owned looked like the worst one on the block. I cleaned it up and kept it neat. But all the upgrades I made where in side. Nineteen years later I sold it. It was the only house on the block that had never been broken in to and when the new oweners ask for the key to the front door all I could do was say "sorry". In nineteen years I had never locked the door. And I couldn't fine my keys. I also sold it for a much higher profit then all my neighbors. This concept is not new. Does anyone else remember the spoof done by SNL in the 70's? A commercial parody featuring a luxury vehicle called "The Chameleon XLE." The interior of the car was said to be filled with the most luxurious materials, while the exterior of the car, featuring a wire hanger antenna and mismatched hub caps, was an "anti theft" device. Classic. i had to make my new car like like crap when i worked in the bronx in 1972, or it would have been vandalized and stolen. I LOVE this post. We have traveled by bus all over Latin America and always uglify our stuff, its the only way to stay safe. It also creates less of a division between you and the people you are traveling with. We also buy local luggage so it looks like the stuff everyone else has. And we don't use computer bags or camera cases. I keep my camera in an ugly coin purse I bought in Ecuador. Around 20 years ago, I had a moderately expensive bike. It would be around $500 or more today. It was uglified with brown paint and reflector tape. One day, the shared house I was living in with a bunch of students got burglarized. Many things were stolen, including other bicycles, but mine was ignored. It wasn't even locked up. My mini truck is also ugly. Not super-ugly, but it looks like it's been used to haul stuff and been hit a couple time, which it has. I've tossed my bike into the bed, and sometimes haven't had the inclination to lock it up. (Well, used to, a few years back.) Now, by this time, the bike was 15 years old, and not very valuable, but I still have that old bike. My bike was built up from a dinged frame, so it was cheaper than retail, but the retail back then was $500. So, it was an expensive bike and the most expensive one of all the bikes that could have been filched. Although one might as well just buy old, ugly stuff and save money yeah? As bizarre and funny as this concept is, bet it works. Vanity is a huge deciding factor in the things a thief will take. Very smart tactic to uglify your items. It's sad indeed that methods such as these have to be resorted to, but theft is common. Will have to keep this in mind! Set aside clean close and shoes and appearance for business,i am always astounded by how people care about what they look like, its almost sick, if arrogance(sometimes fear of being juged) disappeared would it cause another economic crash? My house and yard are more hippy and unmanicured for environmental reasons but in addition leaving a porch window taped cracked, some siding paint peeled and a clunking 2nd car in the drive keeps people from thinking I make money or have valuable goods to steal and live alone. Why spend nearly ten bucks (plus S&H) on sandwich bags? Take a bite out of your sandwich after you make it and make sure you press in with your fingers to make indendations in the bread. If anyone else would want to eat it...they're probably hungrier than you are. You are the smartest one here. Truly useful and expert advice! Sorry Deborah and "Financial Samurai" but you are missing a little bit the point. First of all, most people(me too) are buying things for their function not for their presentation. An Ipod, uglified still remains an Ipod. A modern highend digital camera still remains a modern highend digital camera and doesn't become (even comparable) to old stuff only because you put some tape around. Second, it's has nothing to do with storing it at home, but with using it outside. So a safe or deposit box wouldn't be of any help. I just went to my travel list for Columbia and Ecuador and added two big rice bags with holes precut for fitting around my elderly but super fine Eagle Creek Switchback Max 22" and it's detachable day pack. What a fabulous idea! I don't want to ride a bus looking like some "rich American." Will be using removable tape with personal artwork around my camera and laptop (if I take it, which I probably won't). I will most likely just take a big flash drive to store lots of stuff from my hard drive to access at internet cafes. I have previously primarily traveled in Europe, Argentina, and Uruguay. Argentina is so different from Columbia. I never had to worry there about my nice bags or things. I seldom carry a day pack or bag in the daytime. I keep most money in soft bra pocket created by sewing two Tactel soft bra length camisoles at the bottom with elastic thread. They fit over my real supportive bra. It creates a pocket for all kinds of important "thin" things. I hang my tiny camera case (which will soon be uglified), a feather weight tote in a pocket for purchases, and anything else I REALLY NEED on my elastic belt. I often wear a big wide scarf tied loosely to cover what I am carrying. That way I can just relax and enjoy walking and seeing everything. I have never had anyone attempt to steal any of my things and hope to keep it that way. These are fantastic ideas! who would keep her ice cream in a communal dorm freezer. To keep it from being eaten, she would take one of her clean white socks and stick it into the container once it had been opened. She said it worked pretty well. I don't place my self-worth on the appearance of my items, but many others, including clients, certainly care about neatness of things like a bike, car, or phone. As a professional in my field, I would lose business if I pulled out a dinged-up phone, or if I drove up in a car that looked like a beater. I wear clean clothes, drive a clean car, and respect myself enough to take good care of my belongings. I can understand that while traveling to an unsafe location you should take precautions, but I do not drastically alter my lifestyle (nor should you have to), including the conditions of my things which I work and save so hard to purchase. Try empowering yourself, instead of giving up so much personal freedom to thieves. As for food, if someone is taking your sandwich at work, address your team or coworkers face-to-face, and command the respect that you deserve. I've had to do this, and after making it clear that no one should eat my food, it stopped (sometimes people just aren't raised with the values that should prevent them from stealing what to them is "just a sandwich"). All of this incognito activity will leave you sneaking around your own belongings. You deserve better, people! Another thing you can do is personalize your stuff in ways that make it hard to resell but not necessarily ugly to you. For instance, decorate your electronics with enamel paints in a bright pattern that includes your name. My pocket knife has my initials painted on it in nail polish. Put distinctive bumper stickers on your bike... or on your laptop. Of course, some of these things can be removed, but the more you personalize your gear, the more trouble you make for a thief who would resell it, and the more likely s/he will look elsewhere. You also have a better chance of identifying the item if police locate it. These are great ideas, and I totally agree with the concept. When we bought our son his macbook for college, I strongly suggested he take some Sharpies to the bright white outside of the macbook and color on it whatever his creative heart desired. He started with Darth Vader which eventually morphed into Napoleon (go figure), but no one ever tried to steal it because his artwork make the laptop so easily identifiable. I may "uglify" my point and shoot camera, but I don't see how one could do that to an SLR. That's another of my things that's staying nice and, when taken out of the house, doesn't leave my sight or reach. You're definitely crossing the line when it comes to my cars. People can screw themselves when it comes to vandalism... It wasn't too long ago, but we talked to a guy who owns a Porsche 911 SC. Sadly, someone had the guts to key the car... Who's nearly 30 years old and worth less than just about every new car out there. Incredible what people will do when they feel inferior. If you aren't really into bikes you may not see the point of the uglification, but a LOT of bikes get stolen, and even the best locks available are pretty easy to beat for professional thieves. People who use their bikes as transport really have to consider this as an option (or ride a beater, or get used so it's not such a big loss when it disappears; but it still stinks when your ride turns up gone--these aren't kept in garages like the ones everyone else rides around the block on weekends, they go to work and the store and everywhere else). Even crappy bikes get stolen all the time. BTW, $1000 is not a particularly expensive bike, and the one in the picture is only about $600 MSRP stock built. Avid transport and recreation cyclists put a LOT into bikes and accessories and I can see why this would be one way to discourage theft and still have fun! I also think the ugly camera and luggage ideas are excellent for travel. I had an actually-cheap bike I used to ride in the winter (saving my decent bike for decent weather). Salt + snow did a real number on the chain, and one day when I was heading out to the movies it seized and I had to carry it the last two blocks to the movie theatre. Locked it up out front, and by the time I got out, it was stolen. They stole a bike that you couldn't even pedal, on a snowy day! Same with my car -- it's 13 years old, and the bumper is all scratched up. Yet it was stolen out of my apartment's parking lot (the cops say the thieves specifically go for the older cars because they're easier to steal). There are almost endless ways to make a cheap safe. The materials you choose vary depending on the items that you want to keep safe, how large the items are and whether you want the safe to be portable. In addition, you can make a sort of a safe that doesn't look like a safe. this odd. but the idea was great. i could still remember i used to put marks on my slippers to let my siblings know that is was mine, and no one even tried wearing it. try selling there stuffs online, it might click. This reminds me of that hilarious Saturday Night Live commercial about the Chameleon XLE, where the inside was a luxury car but it was all beat up outside to protect from getting stolen. I call it Urban Camoflauge. Why I don't mind my car dirty and crap piled inside sorta messy. Nothing to make it look like something to break into. So what scratches and dents. The same with my yard and house, not being immaculate. Nothing to make it seem worth a home break in. The fact I have thousands of dollars worth of household items once you step past the inner front door brand new, with an older shambles outer porch door. Could never guess in an urban neighborhood with all of the other spanking remodeled houses getting attempted break ins or burglaries. I had never thought of Uglification! What a brilliant idea...but will I do it? I'm not sure. That will require some thought. Thanks for the thought provoking article. Those mold bags are hilarious! What a great idea! How do people to make their stuff look like junk feel about owning their stuff. Does the change in appearance psychologically change the value to the owner too? Would you feel embarrassed to show your "junky" stuff to your friends? This is about the dumbest thing I've heard of. I've had a bike stolen that was rusted, dented, no chain and had a plant covering it! My old, beat up crappy car was broken into, not once but several times while the new cars on the block were untouched-older cars are easier to steal as they are less likely to have alarms or special keys. I live in a house with an overgrown yard and peeling paint-we've had to put locks on the gates and barbed wire on the gate to prevent people from just taking anything not nailed down-including the trash someone stole before I could carry it to the trashcan!! I don't know where ya'll live but here, crappy bikes, crappy cars, crappy phones are stolen at the same rate if not higher rates than new stuff. Some people will steal anything. Forget talking to the co-worker, our co-worker just laughs and eats your food in front of you! The other day he offered me some of MY yogurt!!! UGGGGG........ why would anyone want to carry around some ugly camera or ipod? And that bike isnt even a fixie why would anyone want it in the first place? This is the lamest thing i have ever heard of, it is honestly just loosers and crackheads trying to justify how poor and lazy they are because they are too lazy to buy nice stuff! I would never carry some broken looking ipod or a macbook that was all scratched up! I mean really why? Its not like they are super hard to find or collectable or something. The same people that do this are the same broke people that have cracked screens on their Iphone. These people are too lazy to get a job or dont want to quit doing drugs long enough to buy something so super important! I mean my god who would even talk to you if your stuff was all scratched up like this? I mean really? EEEwwww you would look all types of homeless and stuff. OOOOh check out those Jonses! is that a new lawnmower? I just HAVE to get a better one! More expensive! With cupholders! Oh-it's only a BMW mower, false alarm. Ahhh, the superficiality in the air is almost electric. Functionalty > asthetics. Haveing a larger probility of having sometging stolen is a decrese in overall funcionality, therefore, sacrificing asthetics for a lesser probability of theft increases overall functionality. The only logical choice is for the option that increases funcionality. Lets face it, these arn't vases of flowers, their only purpose being to make something look better. They are tools first asthetic pieces second.